Mabul Island is a popular place to stay for travelers that plan to dive at one of the worlds' best dive spots; Sipadan Island. Before the resorts at Sipadan Island were closed due to conservation efforts, Mabul was not visited much. Nowadays it is probably the most popular island to stay overnight because of its close proximity to Sipadan. The island is also quite popular because of the affordable accommodation on and nearby the island. Resorts at other islands in the Celebes Sea, like Kapalai and Mataking only offer very luxurious overnight stays. There are two small villages on the island, where around 2000 local Sea Gypsies (Bajau Laut) live. The local villagers rely on both fishery and tourism. There are no roads on the island; all transport is done by boat. Because Mabul Island is inhabited, the island is less pretty than nearby islands like Kapalai and Mataking. However if you venture out to the more secluded areas, you will find some truly fantastic beaches. Though many visit the island to catch a glimpse of its neighbor Sipadan, Mabul Island is widely recognized as one of the best muck diving spots in the world (it is a macro diving paradise). Those who have visited the islands in this area would say: 'Sipadan for the big formations, pelagic species and turtles, Mabul for the most interesting small marine life like nudibranch, gobies, cuttlefish, frogfish and scorpion fish'. There are a few dive schools on the island, all of them offering dive trips around Mabul, nearby Kapalai and of course at Sipadan. Contrary to the other islands in this region, Mabul Island offers several places to stay. There are resorts for every type of traveler; ranging from basic accommodation to luxurious water bungalows and private water villas. People that like some luxury during their stay should visit either Sipadan Water Village Resort (at Mabul Island) or Mabul Water Bungalows. Cheaper places to stay are Sipadan Mabul Resort, Mabul Beach Resort, Mabul Dive Lodge and Borneo Divers Mabul Dive Resort. Noteworthy is the former oil rig at the open sea that was converted into a resort; Seaventures Dive Resort. There also are a few backpacker lodges, with affordable rooms. 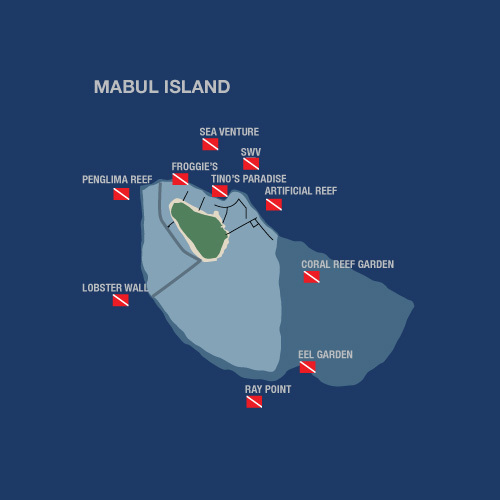 Downside is that apparently those resorts get less daily permits to dive at Sipadan, compared to the more luxurious resorts at Mabul. To get to Mabul Island you first need to take a flight to the coastal city of Tawau. 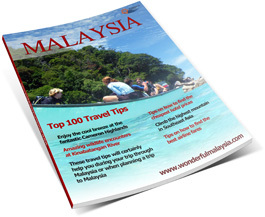 There are daily flights operated by Malaysia Airlines and AirAsia from Kuala Lumpur (and Kota Kinabalu) to Tawau. From Tawau Airport you can either get a taxi (around RM100+) or a bus/minivan to the village of Semporna, a 1,5 hour trip through endless palm oil plantations. At Semporna harbor boats to the neighboring tropical islands depart. The speedboat ride to Mabul takes about 30 minutes. If you make reservations at one of the resorts at the island, then often your package includes an airport pickup, the trip from Tawau Airport to Mabul (via Semporna, including the boat ride). 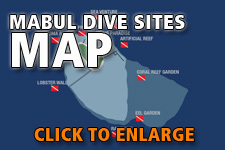 Below you can see the exact location of Mabul Island on the interactive map (in the middle).